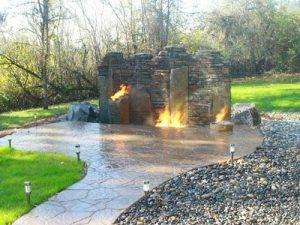 When homeowners are interested in beautifying their backyards or patios, custom built outdoor fire pits and fireplaces are the ideal solutions. Backyard fire pits can be an excellent form of entertainment with family and friends. Outdoor fireplaces can be built to suit individual needs, they are also a warm, inviting and party favorite. An excellent addition to any backyard, while accenting a sitting area. Besides being an interesting addition to a patio, a backyard fire pit provides many benefits. Custom built patio fireplaces increase a home’s property value and ambiance. Solid block construction offers long lasting quality that beautifies the spaces and adds function to the outdoors by providing aesthetically pleasing places for families to gather. Many times, homeowners incorporate built-in flat screen televisions, water elements, and other luxury features into the fireplace units. When it comes time to sell, these additions impact potential buyers. This means the investments bring personal enjoyment and will boost the future salability of the houses. These extra features will stand out when it comes time to move on. Click the button below to leave your information and we’ll get back to you shortly. The latest trends in home decor include ways to extend entertainment space. Outdoor fireplaces allow homeowners to entertain visitors inside and outside their houses. A landscape professional will design the perfect gathering spot so that guests feel welcome. As cooler temperatures arrive, a backyard fire pit supplies extra heat so that exterior entertainment is still possible. Chilly summer nights and fall’s crisp air make fantastic backdrops for outdoor gatherings, especially with the mystical flicker of fire ablaze. Outdoor Fire pits and fireplaces are an excellent source of warmth and comfort. Individuals can spend more time on their patios during cool evenings thanks to these custom-built patio fireplaces. With the variety of heating options, it is possible to use propane without hassle. For a campfire atmosphere, wood burning fireplaces are available as well. For over 16 years, Boulder Falls Landscape has been providing services to customers around the Vancouver area. This company’s certified technicians meet with homeowners to design the perfect outdoor spaces. Some of the business’s most popular requests are custom built patio fireplaces or outdoor fire pits that enhance backyard environments. They create beautiful focal points for gatherings and bring function to the areas. Give Boulder Falls a call today to discuss your outdoor project.